Generally, you get into some situations where you have to search for some codes in particular text files, which have hundreds of lines, and its just hard to find them as you are given specific line number, and counting it manually would just make you work foolishly. The same situation also comes when you are editing a website, and there is some code error in it, at particular lines. These website text files are usually very large and uneasy for anyone to search within. In Mac, you are given an easy option to select and go to a particular line number, making the search of particular line easier and time saving. 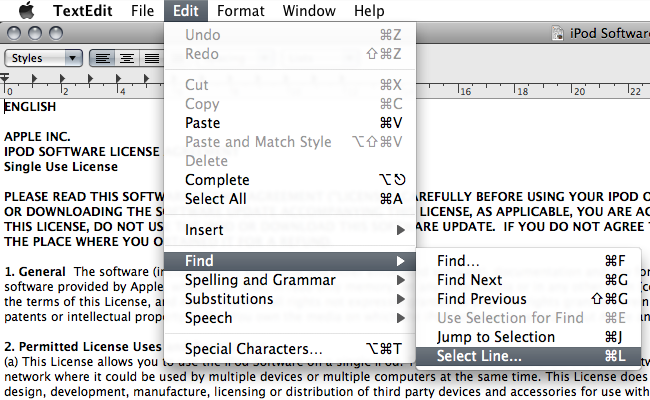 In the textedit options, go to Edit > Find > Select Line. This option can also be opened through the (Command + L) keyboard shortcut. Here is how the tiny window of “Select Line” shows, and asks for the line number you want to reach directly. Enter the line number, and press Enter or Return.